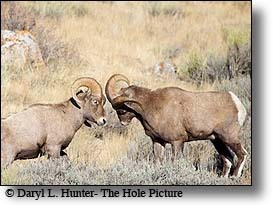 During Breeding Season Rocky Mountain Bighorns take long runs at each other and smack horns, a tough way to impress the Girls. King of the Mountain, Bighorns usually will be found close to cliff escarpments like this one to be able to more rapidly get away from their predators. Native Americans and early settlers prized bighorn meat as the most enjoyable of all American big-game menu choices. The Native Americans also used the horns to fashion ceremonial spoons and handles for their utensils. Horns have also been popular for many centuries as trophies for proud hunters. 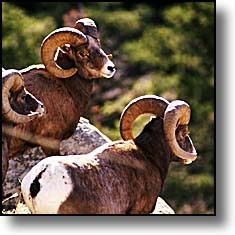 The natural range of The Rocky Mountain Bighorn is from southern Canada to Colorado. 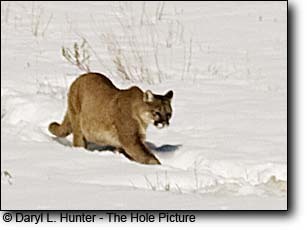 During the summer they inhabit high elevation alpine meadows, grassy mountain slopes and foothill country, all near rugged, rocky cliffs and bluffs, allowing for quick escape from mountain lion, wolves or bears. In winter, Bighorn prefer south facing slopes from 3,000 and 6,000 elevation where annual snowfall is less and the sun and wind help bare off the slopes, because they cannot paw through deep snow to feed. Bighorn Sheep weigh inbetween 115 and 280 lbs. 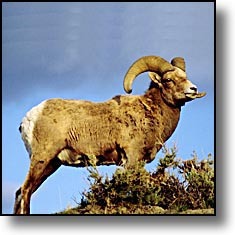 The Bighorn's body is compact and muscular. 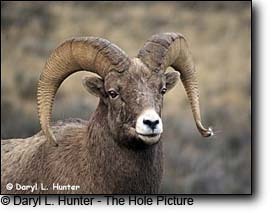 Rams can be recognized by his massive curved horns. The horns curl back over the ears, down then up around the cheek. 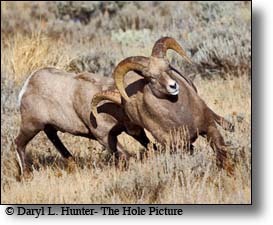 When a ram reaches 7 or 8 years of age, he can have a set of horns with a full curl and a spread of up to 33 inches. Ewes horns are smaller than the rams and have shorter and never exceed half a curl. 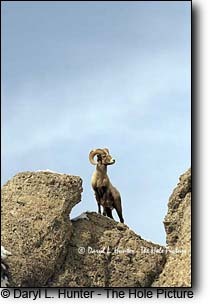 Bighorn have excellent eyesight, which aids in jumping and gaining footholds in the rock. They move up and down cliff faces with amazing ease using ledges sometimes only 2 inches wide for footholds as they bounce from ledge to ledge over spans as wide as 20 feet with all the abondon as an 8 year old on a trampoline. Their keen eyesight helps them watch other animals at distances of up to a mile away. Their cloven hooves are sharp-edged, elastic, and concave and are a huge asset in their vertical home. 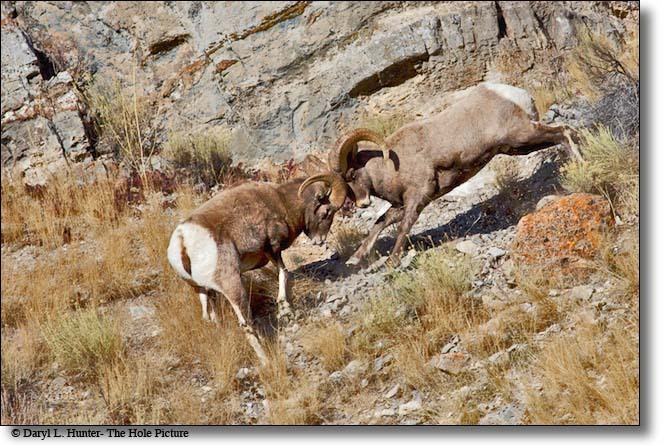 Bighorn sheep are gregarious and may form herds of over 100 animals, but small groups of 8-10 are more common. Mature males usually stay apart in bachelor herds separate the from females and young for most of the year until the the rutt. 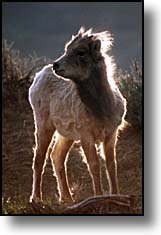 Female bighorn usually do not breed until their second or third year in the wild. Due to competition, males do not usually mate until they are 7 years old, not because they don't want to or can't but because they are not yet tough enough to win the battles. Most sheep live over 10 years, with a maximum of 20 years. Ewes are protective of their young for many months. In the spring yearlings are abandoned while the ewe is giving birth to her next lamb. 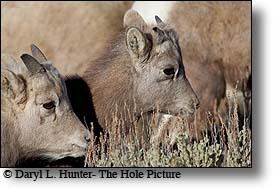 Bighorn sheep find safety in numbers as do most herd animals they and are vigilant for predators such as Coyotes and Mountain Lions. Newborns are natural cliff climbers and are able to follow their mothers at a good pace over the rocky terrain after the first week. Within a few weeks of birth.. lambs are completeley weaned by 4-6 months of age. Bighorns are primarily grazers, consuming grasses, sedges, and forbs, but it will take some browse when preferred food is scarce. 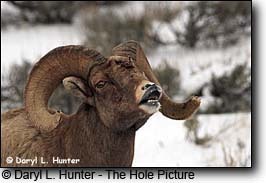 Bighorns are active during the day, feeding morning, noon and night, then lying down to chew their cud. Threatened with eventual extinction, Bighorn numbers are only one-tenth the population that existed when Europeans first began exploiting the Rockies. most sheep live over 10 years, with a maximum of 20 years.